Canon had extensive experience with high speed primes dating back to 1961 when they first offered a 50mm f0.95 lens for their rangefinder camera, followed by a 58mm f1.2 for their SLR. A redesigned version with an aspherical element to become the FD 55mm f1.2 Aspherical of 1971. This was Canon’s first prime lens with an aspherical surface and also had Canon’s original multi-coating called S.S.C for Super Spectra Coating. Its rear element was set at a fixed distance to the image plane providing a simple form of floating element design. The optical design of the FD 55mm f1.2 is fairly conventional Double-Gauss design with 8 elements in 6 groups. This would be the pattern that almost all mid focal length high speed lenses would follow in the future (up until the Zeiss Master Primes changed the formula significantly). Canon’s first cine primes were the result of a collaboration with Cinema Products Corporation and introduced in 1976. Since all of Cinema Products’ 35mm motion picture cameras were based on Mitchell reflex cameras, the K35 lenses were only offered with BNCR mounts. It is believed that the K35 lenses are derived from the high speed Canon FD L series lenses. This would certainly make sense as the cost of designing complex high speed prime lenses with aspherical elements for a very limited production cine lens set would not have been cost effective. In each case, the f-stop is in a good range to easily produce the desired T-stop. Unlike some manufacturers, Canon does not label their T-stops optimistically. But there is no 35mm lens faster than f2 in the FD range, nor is there an 18mm lens at all. This leads me to conclude that for the K35 series, the 24, 55 and 85mm lenses derive from the FD designs, and the 18 and 35mm lenses were purpose-built as cine lens designs. 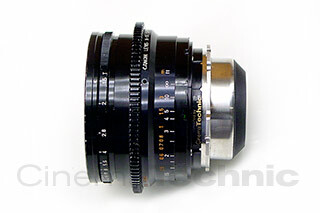 The K35 was the first series of cine lenses to use aspheric surfaces in each focal length. Aspheric lenses allow optical designers to correct aberrations using fewer lens elements than what is possible with conventional spherical optics. 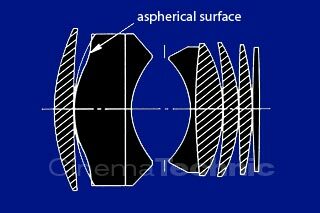 Aspheric lens elements are particularly good at correcting spherical aberration. Spherical aberration is a particular problem when adapting very large aperture lenses to a reflex viewing system which requires a long distance between the rear element vertex and the image plane (to accommodate the mirror reflex shutter). Aspherics allowed a design with less elements to perform well while providing the needed back focus distance. The main drawback of glass aspheric lens elements is that they are very difficult to manufacture and significantly increase the cost of the complete lens. Each lens element needs to be made one at a time with a technician observing the process and correcting the shape as needed to achieve the final result. K35 lenses have a high quality mechanical construction of brass and aluminum. The have very high quality iris diaphragm with a large number of blades. The lenses had focus gears but no iris gears. There were two generations of the K35 series. I am only familiar with the first one, and will update this page later when I get a chance to examine a second generation set. I haven’t had much of a chance to test these lenses, and what little testing I did was almost seven years ago. What I recall from memory is that they are quite sharp wide open, competitive with the Zeiss High Speed series, but have somewhat less contrast than the Zeiss HS and have a warmer color rendition. Example of the use of an aspherical surface in a high speed lens design. Usually only one aspherical surface is used. Although BNCR1 was an industry standard lens mount for mirror reflex motion picture cameras in the 1970’s, it was soon to be eclipsed by the introduction of ARRI’s PL mount in 1980. Once demand for high speed prime lenses reached fever pitch in 2008, there has been renewed interest in the K35 series. But many wish to convert these lenses to PL mount. The conversion process is not straightforward. An adapter is not physically possible. Although the flange focal distance of PL mount [52 mm] is shorter than BNCR mount [61.47mm], BNCR mount has a much larger pilot diameter [68.25] than PL. Any mechanical elements that exceed the clear space available inside the PL mount need to be re-engineered. I have personally developed a conversion for two K35 focal lengths. The 24mm conversion is much less involved. I designed a new rear sub-mount that allows a standard ARRI/Zeiss PL mount to be fitted. The conversion of the 85mm was much more complex. This lens has a fixed rear element that was mounted to the rear cone in the BNCR mount. This had to be relocated to the PL mount rear cone and space was very limited. I was still able to produce a successful conversion. 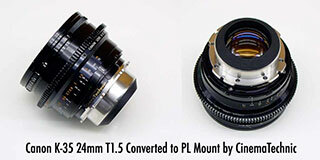 I am not currently offering conversion of the Canon K-35 lenses to PL but may offer this service again in the future. 1. BNCR is an acronym for Blimped Newsreel Camera Reflex, a 35mm camera made by Mitchell Camera that was dominant in the industry before the Arriflex 35BL and Panaflex were introduced. To Hiroshi Suzukawa of Canon and Wilton R. Holm of the AMPTP Motion Picture and Television Research Center for the design and development of a series of super-peed lenses for motion picture photography. This series of super-speed lenses provides superior image resolution by reduction of lens aberrations to improve motion picture photography under low-light conditions. All text and photos ©2016 Jorge Diaz-Amador. All text, images and other content on this site are original copyrighted works. CinemaTechnic and Jorge Diaz-Amador own exclusive rights to this content under the United States Copyright Act of 1976. Unauthorized use and/or duplication of this material without express and written permission from this website’s author and owner is strictly prohibited.